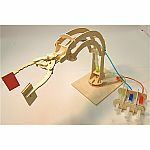 Pathfinders Design and Technology designs and manufactures wooden science kits for educational and recreational use. They are located in Metchosin, just outside of Victoria, on Vancouver Island, British Columbia, Canada. Chief educator, Derek Wulff, teaches classes in the Victoria area. They even spend time with kids in schools, making and using the kits to see how well they deliver curriculum for teachers, and to make sure they are engaging and appropriate for both fun play and educational aspects. So far so good! They like to work with other local companies. Their manufacturer in Taiwan is a local family-run factory, and most of their stores are neighbourhood toy stores, supporting local and small business people (not actually short, but you know what we mean). Pathfinders is dedicated to creating compelling, innovative, wooden science kits that challenge children of all ages to explore the link between science, design, and technology in the world around us. They aim to help the student integrate knowledge gained from constructing the kits by providing links to educational resources to enhance their understanding of math and science as well as historical principles. Pathfinders aims to provide such fun and interesting kits that they will be an attractive and desirable toy for anyone from a small child to an executive planning a friendly take over. They are an environmentally friendly company and use recyclable materials, natural, untreated wood, and local resources and production as much as possible. All of their kits are tested to make sure they are 100% safe, so if the dog (or a child) eats the glue then s/he will not be exposed to any unsafe levels of chemicals of any kind. Same with the other parts like that (like the clay projectiles). They respect our customers health like we want to be respected! Who is Derek Wulff Anyway? Derek is a BC certified teacher who has been teaching grades K to 10 for the past 13 years. He has taught a wide variety of subjects, but most recently science in middle school. He is a lifelong artist and athlete, father and coach, gardener, author and environmentalist, and loves the rich learning experiences of hands-on science. He enjoys teaching and shares his enthusiasm with children of all ages who want to learn new things and make sense of their world around them (to the extent that any of us can!). The courses he teaches are fun and challenging, with an individual approach, the way learning should be! Derek designs all of the kits produced here at Pathfinders, and recently joined One Percent for the Planet, donating 1% of sales to protect, and enhance the natural environment. This year Pathfinders donated to West Coast Environmental Law, The David Suzuki Foundation and The Land Conservancy. Pathfinders has recently joined 1% for the Planet, and will be donating 1% of their profits to protecting and buying important habitat, through Habitat trusts that aim to buy and protect critical habitat areas for plants and animals.